Professor Sir Ludwig "Poppa" Guttmann, (1899 - 1980) held the first Paralympic event in 1948. He was a German-born British neurologist. The first Paralympic sports competition were held in Buckinghamshire, England in 1948 and became known as the Stoke Mandeville Games. Guttman wanted to give World War II veterans with spinal cord injuries or missing limbs from war injuries a sense of purpose. In 1952 competitors from the Netherlands took part in the competition, giving an international notion to the movement. The first Olympic-style games for athletes with a disability were held in Rome in 1960; officially called the 9th Annual International Stoke Mandeville Games, these are considered to be the first Paralympic Games. The first Winter Paralympics were held in Örnsköldsvik, Sweden in 1976. Since 1988, the Summer Paralympics have been held in conjunction with the Olympic Games in the same host city. This practice was adopted in 1992 for the Winter Paralympics, and became an official policy of the International Olympic Committee and the IPC following a June 19, 2001 agreement. The Games take place three weeks after the closing of the Olympics, in the same host city and using the same facilities. Cities bidding to host the Olympic Games must include the Paralympic Games in their bid, and typically both Games are now run by a single organizing committee. 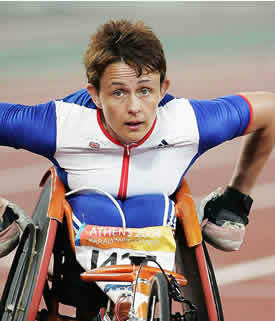 Paralympic games has grown from around 400 athletes in Rome to over 3,900 athletes from 164 countries in London in 2012.